Automobile air conditioning (also called A/C) systems use air conditioning to cool the air in a vehicle. 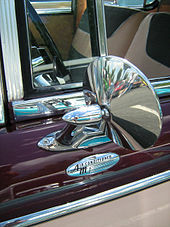 In 1939, Packard became the first automobile manufacturer to offer an air conditioning unit in its cars. These were manufactured by Bishop and Babcock Co, of Cleveland, Ohio. The "Bishop and Babcock Weather Conditioner" also incorporated a heater. Cars ordered with the new "Weather Conditioner" were shipped from Packard's East Grand Boulevard facility to the B&B factory where the conversion was performed. Once complete, the car was shipped to a local dealer where the customer would take delivery. In 1954, the Nash Ambassador was the first American automobile to have a front-end, fully integrated heating, ventilating, and air-conditioning system. The Nash-Kelvinator corporation used its experience in refrigeration to introduce the automobile industry's first compact and affordable, single-unit heating and air conditioning system optional for its Nash models. This was the first mass market system with controls on the dash and an electric clutch. This system was also compact and serviceable with all of its components installed under the hood or in the cowl area. Combining heating, cooling, and ventilating, the new air conditioning system for the Nash cars was called the "All-Weather Eye". This followed the marketing name of "Weather Eye" for Nash's fresh-air automotive heating and ventilating system that was first used in 1938. With a single thermostatic control, the Nash passenger compartment air cooling option was "a good and remarkably inexpensive" system. The system had cold air for passengers enter through dash-mounted vents. Nash's exclusive "remarkable advance" was not only the "sophisticated" unified system, but also its $345 price that beat all other systems. Most competing systems used a separate heating system and an engine-mounted compressor, driven by the engine crankshaft via a belt, with an evaporator in the car's trunk to deliver cold air through the rear parcel shelf and overhead vents. 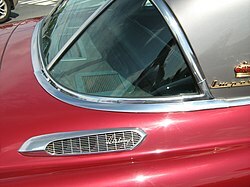 General Motors made a front-mounted air conditioning system optional in 1954 on Pontiacs with a straight-eight engine that added separate controls and air distribution. The alternative layout pioneered by Nash "became established practice and continues to form the basis of the modern and more sophisticated automatic climate control systems." The innovation was adopted quickly and new features to air conditioning like the Cadillac Comfort Control which was a completely automatic heating and cooling system set by dial thermostat was introduced as an industry first in the 1964 model year. By 1960 about 20% of all cars in the U.S. had air-conditioning, with the percentage increasing to 80% in the warm areas of the Southwest. American Motors made air conditioning standard equipment on all AMC Ambassadors starting with the 1968 model year, a first in the mass market, with a base price starting at $2,671. By 1969, 54% of domestic automobiles were equipped with air conditioning, with the feature needed not only for passenger comfort, but also to increase the car's resale value. To cool the air it used latent heat (in other words, cooling by water evaporation). Water inside the device evaporates and in the process transfers heat from the surrounding air. The cool moisture-laden air is then directed to the inside of the car. The evaporate "cooling" effect decreases with humidity because the air is already saturated with water. Therefore, the lower the humidity, such as in dry desert regions, the better the system works. Car coolers were popular, especially among summer tourists visiting or crossing the southwestern United States states of California, Arizona, Texas, New Mexico, and Nevada. 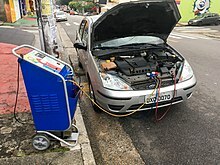 Regassing the air conditioning of a Ford Focus. Circulating refrigerant gas vapor (which also carries the compressor lubricant oil across the system along with it) from the evaporator enters the gas compressor in the engine bay, usually an axial piston pump compressor, and is compressed to a higher pressure, resulting in a higher temperature as well. The hot, compressed refrigerant vapor is now at a temperature and pressure at which it can be condensed and is routed through a condenser, usually in front of the car's radiator. Here the refrigerant is cooled by air flowing across the condenser coils (originating from the vehicle's movement or from a fan, often the same fan of the cooling radiator if the condenser is mounted on it, automatically turned on when the vehicle is stationary or moving at low speeds) and condensed into a liquid. Thus, the circulating refrigerant rejects heat from the system and the heat is carried away by the air. The condensed and pressurized liquid refrigerant is next routed through the receiver-drier, that is, a one way desiccant and filter cartridge that both dehydrates the refrigerant and compressor lubricant oil mixture in order to remove any residual water content (which would become ice inside the expansion valve and therefore clog it) that the vacuum done prior to the charging process didn't manage to remove from the system, and filters it in order to remove any solid particles carried by the mixture, and then through a thermal expansion valve where it undergoes an abrupt reduction in pressure. That pressure reduction results in flash evaporation of a part of the liquid refrigerant, lowering its temperature. The cold refrigerant is then routed through the evaporator coil in the passenger compartment. The air, often after being filtered by a cabin air filter, is blown by an adjustable speed electric powered centrifugal fan across the evaporator, causing the liquid part of the cold refrigerant mixture to evaporate as well, further lowering the temperature. The warm air is therefore cooled, and also deprived of any humidity (which condenses on the evaporator coils and is drained outside of the vehicle) in the process. It is then passed through a heater matrix, inside of which the engine's coolant circulates, where it can be reheated to a certain degree or even a certain temperature selected by the user and then delivered inside the vehicle's cabin through a set of adjustable vents. Another way of adjusting the desired air temperature, this time by working on the system's cooling capacity, is precisely regulating the centrifugal fan speed so that only the strictly required volumetric flow rate of air is cooled by the evaporator. The user is also given the option to close the vehicle's external air flaps, in order to achieve even faster and stronger cooling by recirculating the already cooled air inside the cabin to the evaporator. The compressor can be driven by the car's engine (e.g. via a belt, often the serpentine belt, and an electromagnetically actuated clutch; an electronically actuated variable displacement compressor can also be always directly driven by a belt without the need of any clutch and magnet at all) or by an electric motor. In a modern automobile, the A/C system will use around 4 horsepower (3 kW) of the engine's power, thus increasing fuel consumption of the vehicle. ^ "First Air Conditioned Auto". Popular Science. 123 (5): 30. November 1933. Retrieved 16 April 2015. ^ "Michigan Fast Facts and Trivia". 50states.com. Retrieved 16 April 2015. ^ Alder, Dennis (2004). Packard. MBI Publishing. p. 76. ISBN 978-0-7603-1928-4. ^ a b Langworth, Richard M. (1994). Chrysler and Imperial: The Postwar Years. Motorbooks International. ISBN 0-87938-034-9. ^ "1953 Cadillac Brochure". oldcarbrochures.org. p. 5. Archived from the original on 7 February 2015. Retrieved 16 April 2015. ^ "1953-Buick Heating and AC Folder". oldcarbrochures.org. pp. 10–11. Archived from the original on 7 February 2015. Retrieved 16 April 2015. ^ "1953 Oldsmobile Brochure". oldcarbrochures.org. p. 23. Archived from the original on 7 February 2015. Retrieved 16 April 2015. ^ "Nash Low Cost Air Conditioner Cools or Heats by Turning Knob". Popular Mechanics. 101 (5): 86. May 1954. Retrieved 16 April 2015. ^ "One Control Heating Cooling". Motor. 101: 54. 1954. Retrieved 16 April 2015. ^ Gunnell, John, ed. (1987). The Standard Catalog of American Cars 1946–1975. Krause Publications. p. 176. ISBN 978-0-87341-096-0. ^ Daly, Steven (2006). Automotive Air-Conditioning and Climate Control Systems. Elsevier Science & Technology Books. p. 2. ISBN 978-0-7506-6955-9. Retrieved 16 April 2015. ^ a b Wolfe, Steven J. (2000). "HVAC Time Line". Refrigeration Service Engineers Society Twin Cities Chapter. Archived from the original on 21 November 2009. Retrieved 16 April 2015. 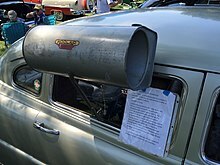 ^ "News of the Automotive World - Nash Air Conditioner Combines Heating, Cooling, and Ventilating". Automotive Industries. 110: 86. 1954. Retrieved 16 April 2015. ^ Stevenson, Heon J. (2008). American Automobile Advertising, 1930–1980: An Illustrated History. McFarland. p. 177. ISBN 978-0-7864-3685-9. Retrieved 16 April 2015. ^ Binder, Al; the Ward's staff (2 February 2001). "Rearview Mirror". Ward's AutoWorld. Archived from the original on 24 November 2011. Retrieved 16 April 2015. ^ Auto Editors of Consumer Guide (29 November 2007). "1953–1955 Nash and Hudson Ramblers". auto.howstuffworks.com. Archived from the original on 4 November 2014. Retrieved 16 April 2015. ^ Nunney, Malcolm J. (2006). Light and Heavy Vehicle Technology. Elsevier Science & Technology Books. p. 147. ISBN 978-0-7506-8037-0. ^ Nash, Gerald D. (1999). Federal Landscape: An Economic History of the Twentieth-Century West. University of Arizona Press. p. 224. ISBN 978-0-8165-1863-0. ^ Lintern, Mike (1977). Complete guide to American cars, 1966-76. AutoMedia. p. 32. ISBN 9780905395012. Archived from the original on 10 June 2016. Retrieved 16 April 2015. ^ "U.S. Business: Shuffle & Cut". Time. 6 October 1967. Retrieved 16 April 2015. ^ "Air Conditioning and Refrigeration Timeline". National Academy of Engineering. Archived from the original on 19 March 2015. Retrieved 16 April 2015. ^ Hinckley, p. 54 "...it was actually an evaporative cooler - something Californians and Southwesterners have on the roofs of their houses and often call 'swamp coolers' or 'swampies"." ^ Heitmann, John Alfred (2009). The Automobile and American Life. McFarland. p. 151. ISBN 9781476601991. Archived from the original on 2 May 2016. Retrieved 16 April 2015. ^ Watt, John R. (1963). Evaporative Air Conditioning. Industrial Press. p. 93. Archived from the original on 25 April 2018. Retrieved 13 August 2017. ^ a b Watt, John R. (1986). Evaporative Air Conditioning Handbook (Second ed.). Springer. ISBN 9781461293873. Archived from the original on 25 April 2018. Retrieved 13 August 2017. ^ "The Easy Way". Popular Mechanics. 75 (5): 676–677. May 1941. Archived from the original on 22 March 2015. Retrieved 16 April 2015. ^ "Impact of Vehicle Air-Conditioning on Fuel Economy" (PDF). National Renewable Energy Laboratory. Archived (PDF) from the original on 19 March 2015. Retrieved 16 April 2015. "Air Conditioners for Your Car". Popular Science. 194 (4): 117–132, includes detailed drawings. April 1969. Retrieved 16 April 2015. This page was last edited on 5 December 2018, at 14:09 (UTC).